Directed by Bill Siegel. USA. 2013. 92 mins. This unconventional sports documentary investigates the spiritual life of America’s greatest boxing legend. Brash Cassius Clay burst into the American consciousness in the early 1960s, just ahead of the Civil Rights movement, and found himself in the center of national controversies over race, religion, and war. 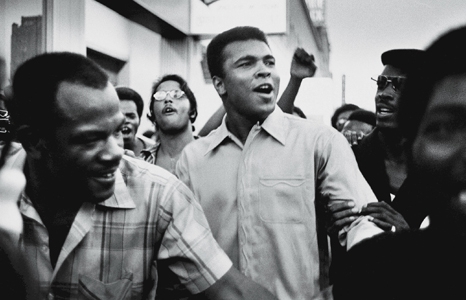 From joining the Nation of Islam and changing his name to Muhammad Ali, to his refusal to serve in the Vietnam War, to his global humanitarian work, Ali remains an inspiring and divisive figure. Produced by Kartemquin Films (Hoop Dreams and The Interrupters), and directed by Academy Award–nominated filmmaker Bill Siegel (The Weather Underground), this powerful documentary examines how one of the most celebrated sports champions of the 20th century risked his fame and fortune to follow his faith and conscience. Official selection: Traverse City Film Festival, Vancouver International Film Festival, and Seattle International Film Festival. Join us for a red-carpet reception dedicated to boxing icon Muhammad Ali and the sport that made him famous. Dress for a glamorous ringside bash, complete with live jazz from Riya Davis and Adagio. Your ticket includes a dinner buffet by Mom’s Soul Food. Wine, beer, and soda available for purchase. The Trials of Muhammad Ali screens at 7:30pm—Hawai‘i State Boxing Commissioner Quenton M. Brown Sr. will introduce the film and talk about his mentor and friend. $35, $30 museum members. Purchase online.